UPDATED: Mon., Feb. 13, 2017, 10:52 p.m.
Gonzaga stayed on top of both major college basketball polls for the third straight week, matching the 2013 team’s three-week stint at No. 1. The Zags (26-0) slightly strengthened their grip on No. 1 from last week. In the AP Top 25, Gonzaga picked up an additional first-place vote (60 overall) and one more point (1,620). No. 2 Villanova (24-2) lost one first-place vote (5) and one point (1,564). Kansas remained at No. 3. The rest of the AP top 10 experienced major changes. Baylor jumped up two spots to No. 4, but the Bears lost to Texas Tech on Monday night. Arizona climbed from ninth to fifth. UCLA jumped from No. 10 to No. 6. Oregon slipped two spots to seventh, followed by last week’s No. 4 Louisville, West Virginia and North Carolina. In the USA Today rankings, Gonzaga earned 29 of 32 first-place votes, one more than last week, for 797 points. No. 2 Villanova received the remaining three first-place votes and 770 points. The Wildcats were followed by Kansas, Baylor, UCLA, Arizona, Louisville, Oregon, North Carolina and Wisconsin. The top four in both polls matches the four No. 1 seeds from Saturday’s bracket preview show, but the order is completely different. The selection committee had Villanova as the No. 1 overall seed, followed by Kansas, Baylor and Gonzaga, which suggested the Zags are one loss from falling to a two or three seed. 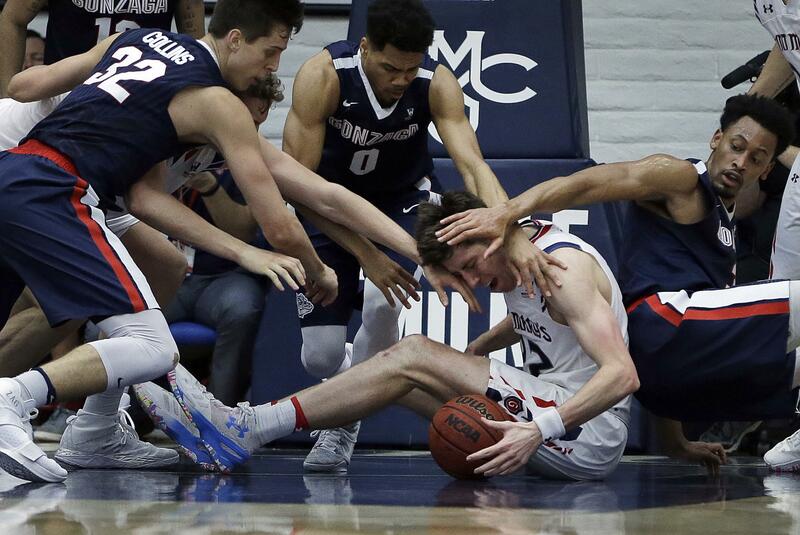 Gonzaga’s 2-0 week included a 74-64 win over Saint Mary’s in Moraga. The Gaels (22-3) dropped to No. 21 in the coaches’ poll, No. 22 in AP. There are a handful of ranked matchups this week: Kansas faces West Virginia on Monday and Baylor on Saturday; Virginia entertains Duke on Wednesday and visits North Carolina on Saturday; and Maryland travels to Wisconsin on Sunday. Twelve ranked AP teams lost last week. Notre Dame moved back into the poll at No. 25 after dropping out for one week. The Big Ten, which didn’t have a team among the selection committee’s top 16 seeds, didn’t help itself when its best candidate, No. 7 Wisconsin, lost at home to Northwestern. The Badgers slipped from No. 7 to No. 11. The Wildcats are building a decent resume in pursuit of its first NCAA tournament appearance. Published: Feb. 13, 2017, 9:16 p.m. Updated: Feb. 13, 2017, 10:52 p.m.